Professional adventure sportswoman Serenity Coyne has her hands on a large rock in a crevice on Dorr Mountain at Acadia National Park just before the rock fell on her leg on Labor Day. ACADIA NATIONAL PARK, Maine — A woman who was severely injured in a Labor Day accident while hiking down Dorr Mountain had ventured off a steep trail when a rock weighing several hundred pounds came loose and crushed her leg, according to Acadia officials. 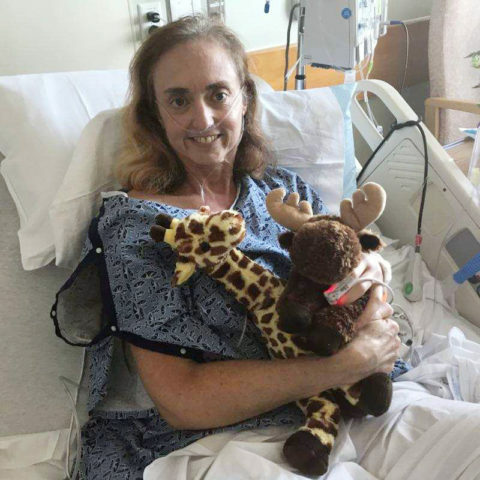 Park officials on Monday called the accident “horrible” and that they wish the hiker, who has undergone multiple subsequent surgeries on her leg, a full recovery. Park officials have declined to release the woman’s name, but she has been identified by her husband as professional adventure hiker and mountain climber Serenity Coyne, 53, of Boston. Professional adventure sportswoman Serenity Coyne in the hospital after surgery for an accident that occurred at Acadia National Park on Labor Day. The gruesome injury happened as Coyne stood underneath the large rock, which was lodged between two enormous boulders a few feet off the Dorr Mountain Ladder Trail, according to her husband, Michael Coyne. A photo he took of his wife a few moments before the accident shows her standing in the crevice under the rock, touching the bottom of it with both hands before it fell and crushed her lower left leg. He said his wife “gingerly” touched the rock right before it fell. It also struck him as it fell and bruised his back, according to Coyne. Coyne said the accident occurred only three or four feet off the trail, but Acadia officials said Monday that Serenity Coyne was approximately 15 feet off the trail when the rock fell on her. The incident illustrates the risks of venturing off trails, especially on steep terrain, park officials said. Each of the hundreds of trails in the park is inspected at least once a year by a senior member of the park’s trail staff to make sure it is in good condition, according to Gary Stellpflug, Acadia’s trails chief. He said the rock that crushed her leg had not been moved or positioned by park staff as part of trail maintenance, and was not known to be a potential hazard prior to the accident. Christie Anastasia and John Kelly, spokespersons for the park, each said Monday that many other park employees are routinely out on the trails, both for work and on personal time, and report whatever hazards they may see, whether it is a unstable rock on a trail or looming over it, or a tree that has fallen across a road or path. Park staff check on all reports they receive of possible hazards, they said, and the park removes those that they agree pose an undue risk to the public. But there is a certain amount of risk visitors assume when visiting the park, which is why there aren’t railings at the top of every steep cliff, they said. In many places, the park has erected signs encouraging hikers to stay on marked trails, but there is no requirement that they do so. Coyne and his wife, who have been taking calculated risks as adventure hikers and climbers since they started fundraising for their charity, Expedition Outreach, in 1995, said they plan to return to Acadia.